Career U.S. Intelligence officer Malcolm Nance will examine how Russia has used cyber warfare, political propaganda, and manipulation of our perception of reality--and will do so again--to weaponize American news, traditional media, social media, and the workings of the internet to attack and break apart democratic institutions from within, and what we can expect to come should we fail to stop their next attack. Nance has utilized top secret Russian-sourced political and hybrid warfare strategy documents to demonstrate the master plan to undermine American institutions that has been in effect from the Cold War to the present day. Based on original research and countless interviews with espionage experts, Nance examines how Putin's recent hacking accomplished a crucial first step for destabilizing the West for Russia, and why Putin is just the man to do it. Nance exposes how Russia has supported the campaigns of right-wing extremists throughout both the U.S. and Europe to leverage an axis of autocracy, and how Putin's agencies have worked since 2010 to bring fringe candidate Donald Trump into elections. 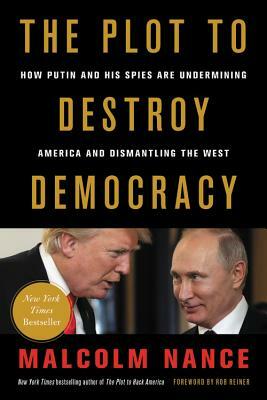 Revelatory, insightful, and shocking, The Plot To Destroy Democracy puts a professional spy lens on Putin's plot and unravels it play-by-play. In the end, he provides a better understanding of why Putin's efforts are a serious threat to our national security and global alliances--in much more than one election--and a blistering indictment of Putin's puppet, President Donald J. Trump. Malcolm Nance is author of the New York Times bestseller The Plot to Hack America. He is a globally recognized Intelligence community member and a counter-terrorism analyst for NBC News and MSNBC.